Molly Carroll grew up in Baton Rouge, Louisiana. She graduated from Rutgers University with a B.S. in Biomedical Engineering researching the impact of tumor-associated macrophages on glioblastoma progression. In 2012 she moved to Madison, WI to complete her Ph.D. at UW Madison in the Biomedical Engineering department focusing on systems biology approaches exploring how ovarian cancer tumor cells interact with stromal and immune cell populations to drive disease progression. In her spare time, she enjoys cooking at home and hiking. 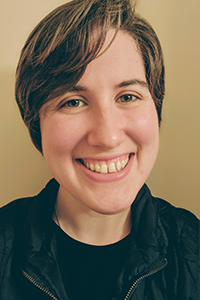 Molly Carroll is focused on utilizing machine learning techniques in conjunction with high-throughput screens of cancer proteomics to explore the impact of protein expression and activation in tumors that can be used to predict response to targeted therapies. Additionally, through collaboration with the University of Turku and University of Helsinki's HERCULES project, she is developing predictive models for ovarian cancer patient prognostics built upon high throughput analysis of ascites secretome. M.J. Carroll, K.C. Fogg, H.A. Patel, H.B. Krause, A. Mancha, M.S. Patankar, P.S. Weismann, L. Barroilhet, and P.K. Kreeger. “Alternatively activated macrophages upregulate mesothelial expression of P-selectin to enhance adhesion of ovarian cancer cells.” Cancer Research. 78(13):3560-3573. 2018. L.M. Nusblat, M.J. Carroll, C.M. Roth, “Crosstalk between M2 macrophages and glioma stem cells.” Cellular Oncology. 2017. M.J. Carroll, A. Kapur, M. Felder, M.S. Patankar, P.K. Kreeger. “M2 macrophages induce ovarian cancer cell proliferation via a heparin binding epidermal growth factor/matrix metalloproteinase 9 intercellular feedback loop.” Oncotarget. 7(52):86608-86620, 2016. K. Pollock, T.J. Jaraczewski, M.J. Carroll, D.I. Lebovic, P.K. Kreeger. “Endometriotic epithelial cell response to macrophage-secreted factors is dependent on extracellular matrix context.” Cellular and Molecular Bioengineering. 7, p. 409-420, 2014. M.J. Carroll, L.E. Stopfer, P.K. Kreeger. “A simplified culture system to examine soluble factor interactions between mammalian cells.” Chemical Communications. 50, p. 5279- 5281, 2014.